This article is written by @insidethemiddle. A must read especially for Sunnis. Since the outbreak of the popular uprising in Syria last spring, the media have focussed on the Alawi minority which controls the levers of power in that country. Most often, one hears echoes of mainstream Sunni and Shi’i sources that Alawis represent a heretical or, at best, syncretic deviation from Muslim orthodoxy. Such allegations are not justified. They represent the tendency, especially among Western scholars, to accept Sunni orthodoxy as the norm. As my favorite historian of the Muslim world, the late Marshall Hodgson put it, “[Scholars of Islam], both Muslim and Western, have had a way of absorbing the point of view of orthodox Islam; this has gone so far that Christian Islamists have looked with horror on Muslim heretics.” Of course “heresy” lies in the eyes of the majority. As we know too well from the history of the 20th century, majorities can be as wrong and as untruthful as dissidents except that the lies and delusions of majorities always have more dire consequences. A fairly recent (2010) book by the Israeli scholar Yaron Friedman reveals that such views are the sorts of prejudices that many a majority group uses to vilify those with whom they disagree. 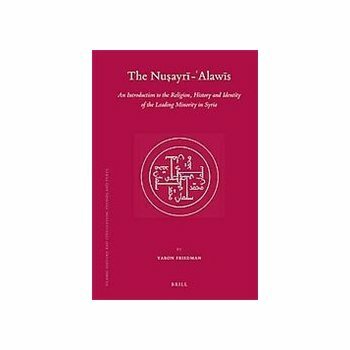 In The Nusayri-Alawis: An Introduction to the Religion, History, and Identity of the Leading Minority in Syria, Friedman mines a recently published (2006) set of volumes of hitherto unavailable Alawi (the more historically accurate term is “Nusaryi”) religious sources. He demonstrates that Alawi religious views are as fully Muslim as those of any other sect. The title of the book is misleading as the fact that members of this group are the “leading minority in Syria” is late 20th-century phenomenon while the book deals almost exclusively with the period from the origins of the sect in the 9th century to the period of political, social, and theological consolidation in the 14th century. To the layperson the significance of 500 or so years in the medieval period may seem purely academic. Far from it. Understanding the origins of the Nusayri sect gives the lie to many of the prejudices and misconceptions that cloud contemporary views. Even beyond the world of Islam, the case of the Nusayris reminds one that orthodoxies are themselves the products of historical forces and that their handle on authority is more a function of political and social forces than of access to truth. The Nusayris are named for one Muhammad ibn Nusayr who was on the margins of Shi’i groups active in southern Iraq in the second half of the 9th century. He represented a mystical brand of Shi’ism in which the power of the Imams who were descended from Ali, the fourth caliph of Islam, was accessible to those with a certain kind of divinely inspired esoteric knowledge. As the sect grew and gained opponents as well as adherents, it was pushed from Basra to Baghdad to Aleppo to the mountains above the Mediterranean coast in western Syria. By the 12th century, a theology that blended the esoteric with more outward manifestations of Islamic belief took shape. Far from seeing themsevles as heretics, Nusayri leaders considered themselves “unitarians” (muwahhidun) because they strove to synthesize mystical and exoteric knowledge. Not surprisingly, they considered themselves the true Muslims. For Nusayris, the five pillars of Islam are as important as they are to their mainstream co-religionists. However, according the Nusayris, these tenets have an esoteric element that is lost on the orthodox. Friedman dubs this an “allegorical interpretation of shar’ia.” The hajj, for example, is not so much a physical journey to Mecca as it is meant to be a personal journey of striving to move from one stage of spiritual understanding to another, higher one. Like mystics in other religious traditions, Nusayris conceive of a very complex hierarchy of spiritual development. They also have a special understanding of key religious figures, most notably Ali, and a distinct calendar of religious holidays. Friedman stresses that Nusayri beliefs are grounded ultimately in the Qur’an and that those elements that strike some as unIslamic (like celebrating Christmas and the ritual use of wine) are derived from the same pre-Islamic Near Eastern traditions that shaped Islam as a whole, if in different ways. It is important to restate that this discussion tells us very little about the social, political, and economic status of today’s Alawis (a term early 20th-century leaders developed to replace “Nusayri” as part of a historically recent effort to “mainstream” the sect). The esoteric knowledge discussed above was the domain of a small group of men and ultimately had little impact on the society as a whole. We know very little about the lives of ordinary Nusayri-Alawis for most of their history until the late 19th century. Over the course of the 20th century the religious component of Nusayri-Alawi identity has diminished as a result of social, political, and economic realities. On the one hand, Alawi leaders have done their utmost to assimilate with the broader Syrian population and overcome the poverty and isolation that shaped the lives of their ancestors for most of their history. On the other hand, Alawi political leaders, most notably the Asad clan, increasingly fall back on narrow tribal and family ties to secure their hold on power. The result has been catastrophic for almost all Syrians, including the mass of average, politically weak Alawis. Because of the misdeeds of the Asads and their cohorts, all too often Alawis as a whole have been demonized by stereotypes, including those that denigrate their spiritual heritage. Beyond the bloody and increasingly sectarian civil war that grips Syria today, the lesson of medieval Nusayri history is that orthodoxies are created at the cost of the spiritual, intellectual, and cultural richness that usually accompanies the birth of a new religious tradition. Early Christian history, for example, teems with competing interpretations of the nature of Jesus and of the sources of knowledge and of experience of the divine. Many of those were lost to history as what became orthodoxy– in tandem with state- and empire-building– took hold. Some of those losses were physical: lost and destroyed texts, for example. Some trends were lost to accusations of deviation and heresy and outright wars to eliminate them. What is most striking about Nusayri-Alawi history is the ability of this small group (totaling less than 2 million worldwide, almost all of them in Syria) to survive 1,000 years in an area that was subject to repeated wars (including those of the Crusades many of which were fought in Nusayri territory) and in which they were usually reviled as heretics. The adage “History is written by the victorious” applies not only to victory in conquest but equally to victory in the creation of orthodoxy. The power of history-writing, however, is that orthodoxies can be divested of their truth claims– if not undermined outright– by re-search and re-writing.